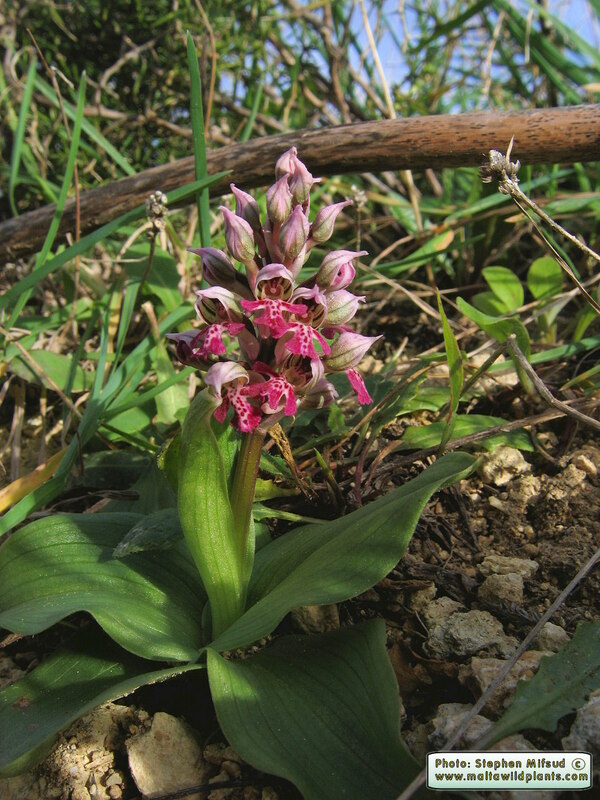 Frequent, particularly common at Dingli Cliffs, garigue near Gnien il-Haddiem in Dingli, Ghajn Tuffieha, Pembroke, Bingemma, etc. 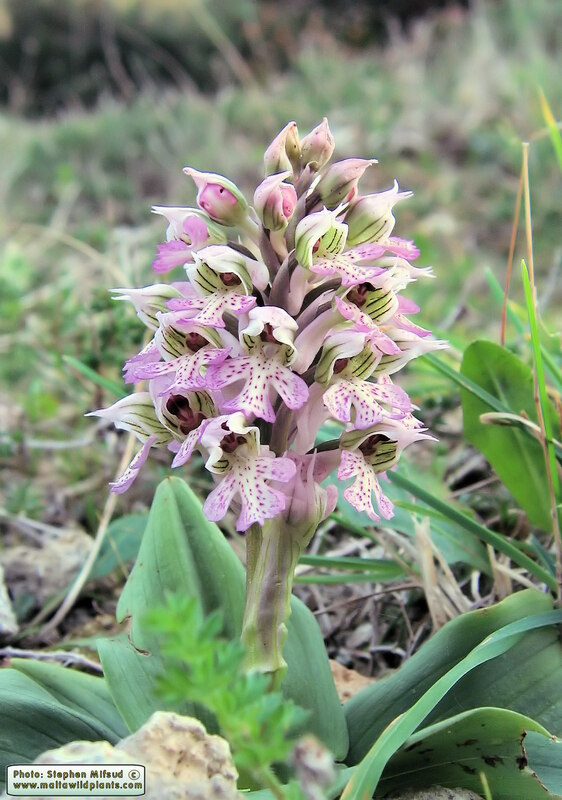 The beauty of this plant is often not noticed since it grows low (about 10cm) and so it could be partially covered by higher surrounding vegetation. 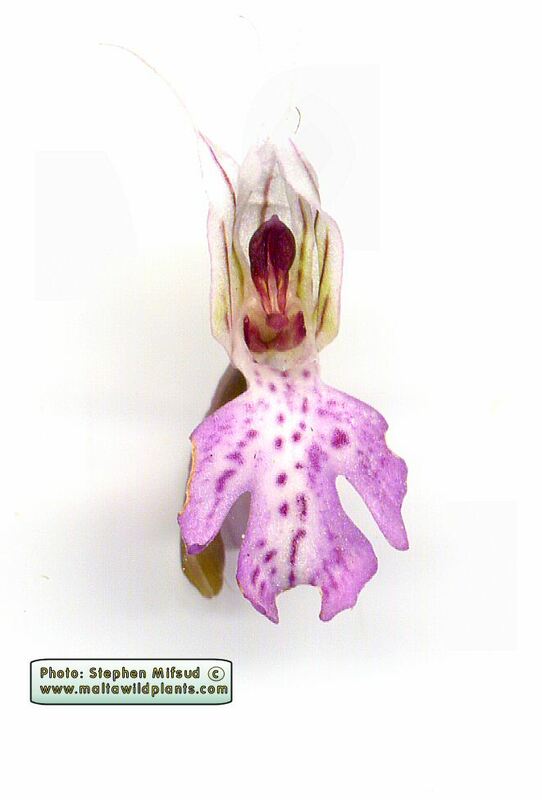 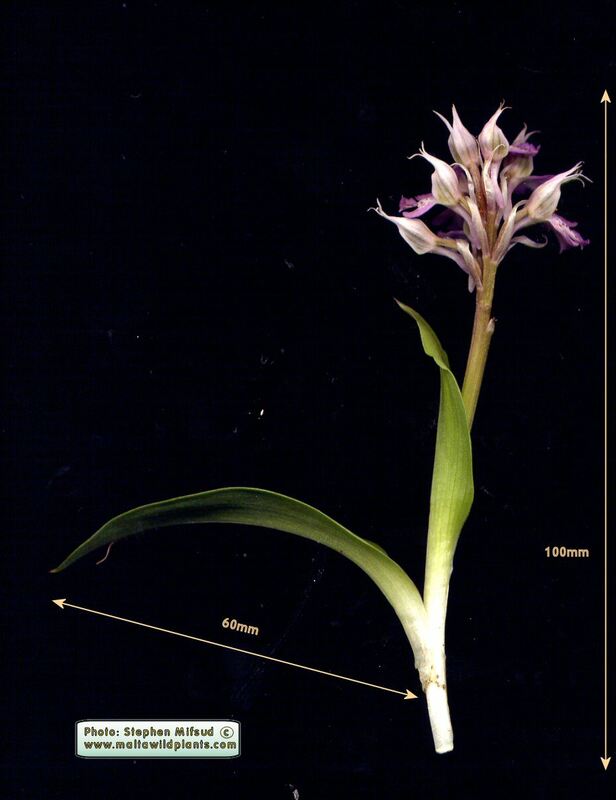 This orchid forms basal rosette of leaves which are lanceolate in shape and about 60-80mm long and 15-25mm wide. 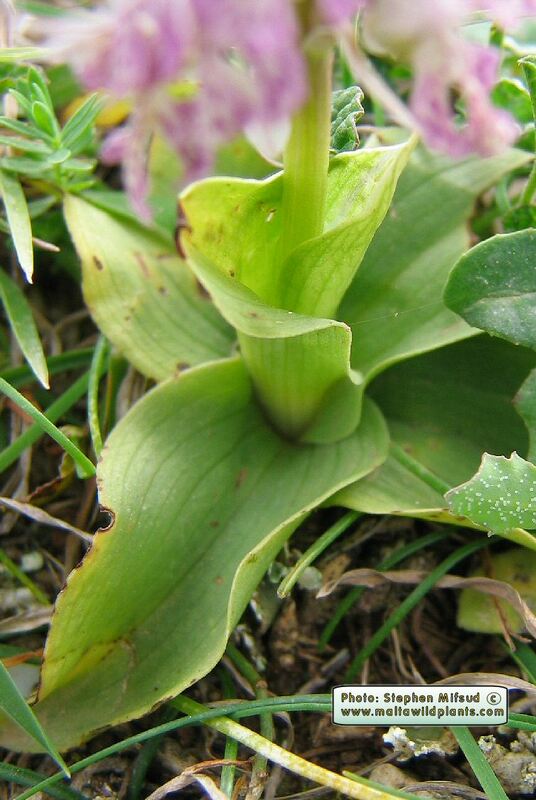 The glabrous leaves are green to light green in colour, have a smooth outline and a parallel venation. 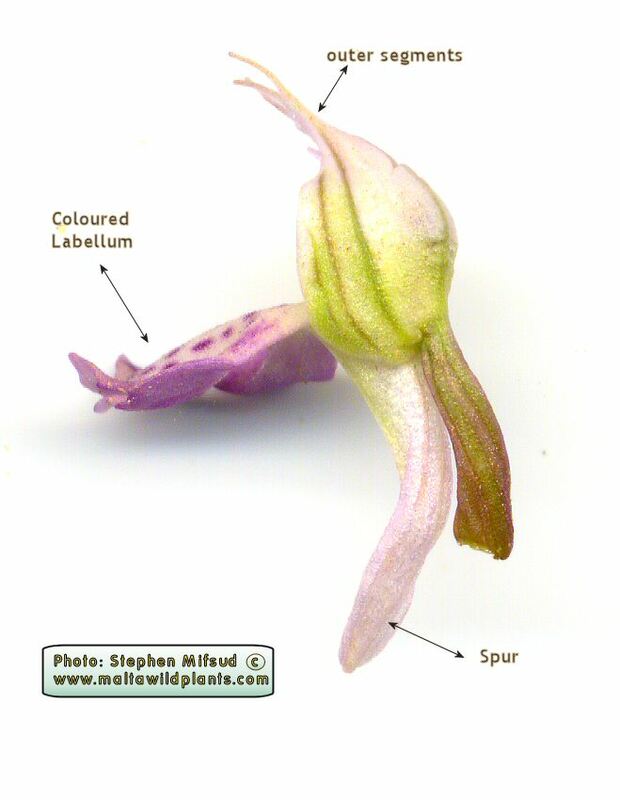 Some leaves are found up along the flowering stem, and these become distinct (not in a rosette arrangement) and have a sheath at the base around the stem. 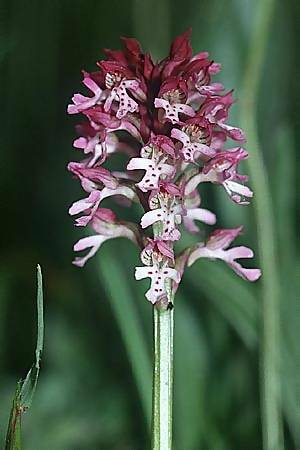 The flowers are arranged in a dense spike on a common and single, fleshy flowering stalk. 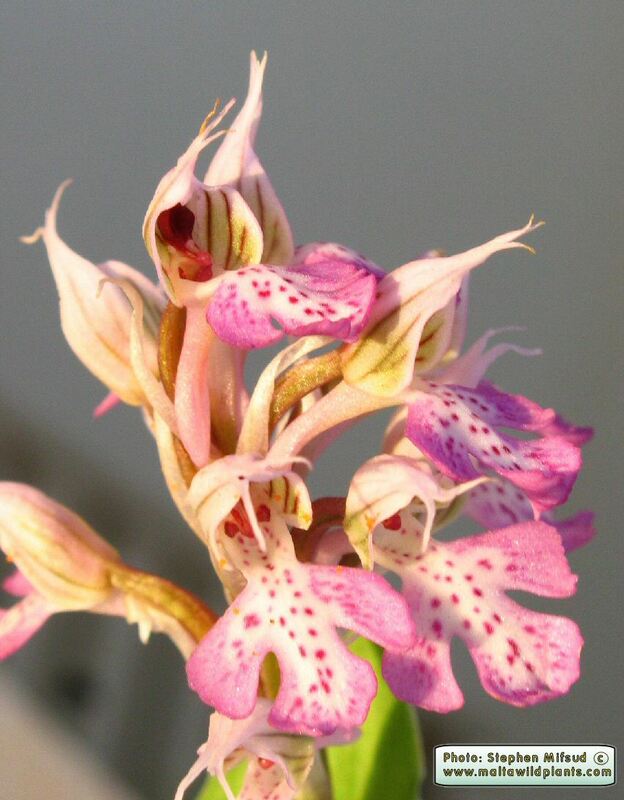 The cluster of flowers grows out close together around the fleshy stem and forms an overall shape of a cone, and hence the plant's name - conical orchid. 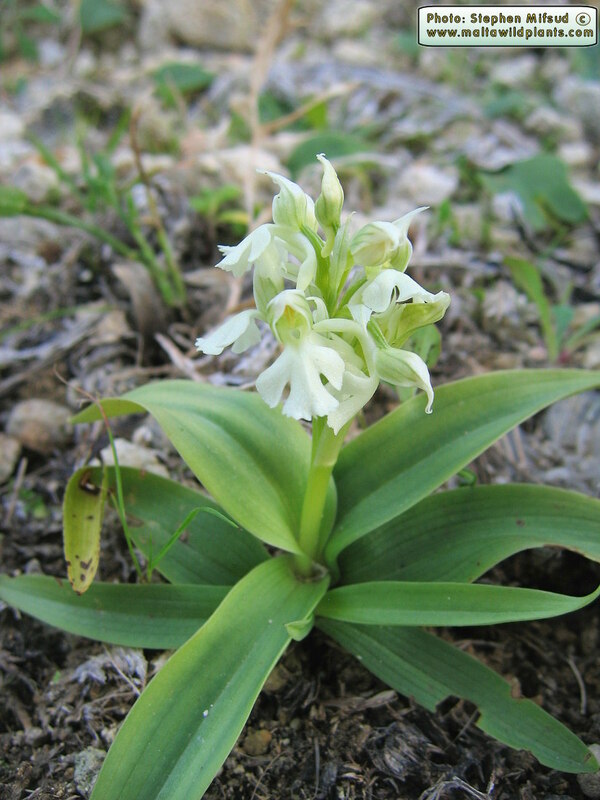 The number of flowers varies from plant to plant but at least about 20. Each flower have 6 tepals and arranged as follows: A lower layer of 3 'sepals' and an upper layer of 3 'petals'. 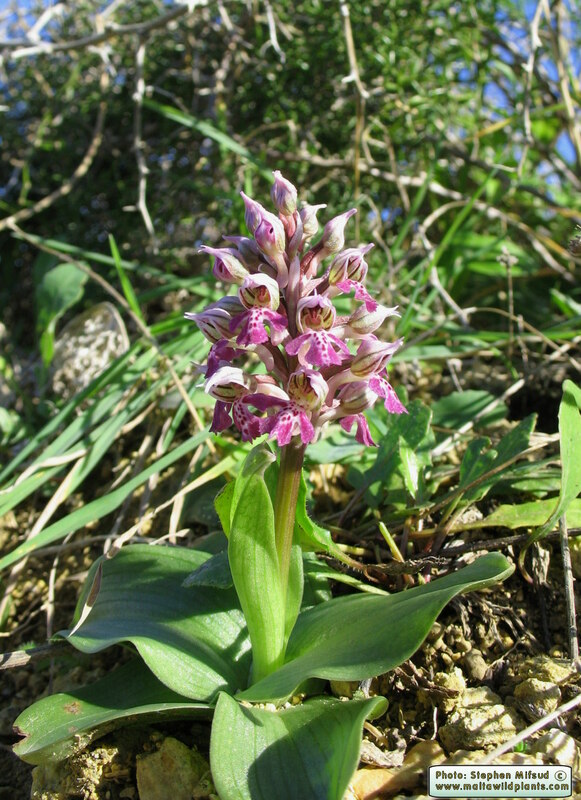 The two layers are very close to each other, nearly at the same locus and are often collectively called as tepals. 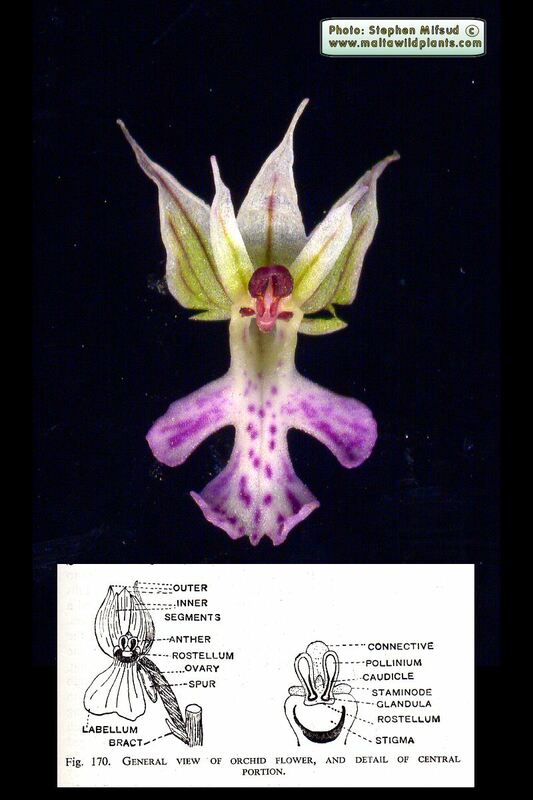 The sepals are at the back side of the flower and form a semi-spherical pouch in which the reproductive organs lay. 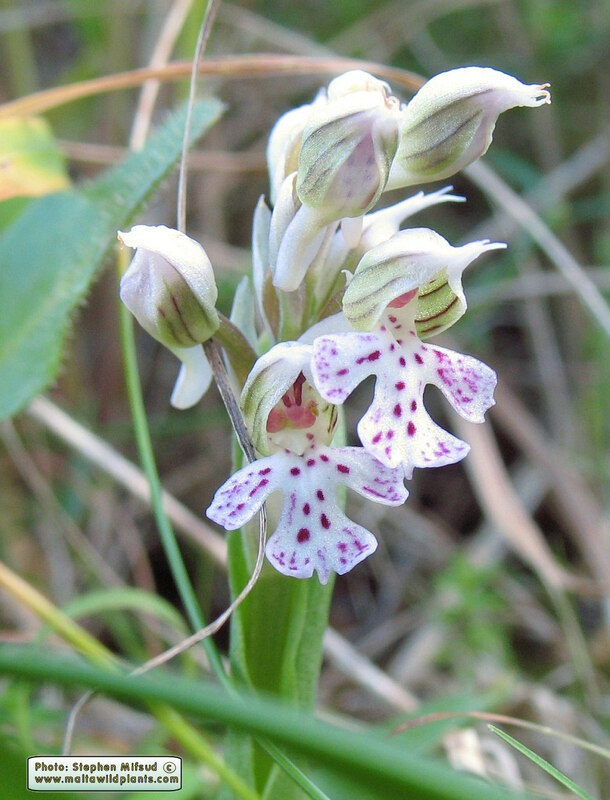 These are white in colour with vertical green stripes. 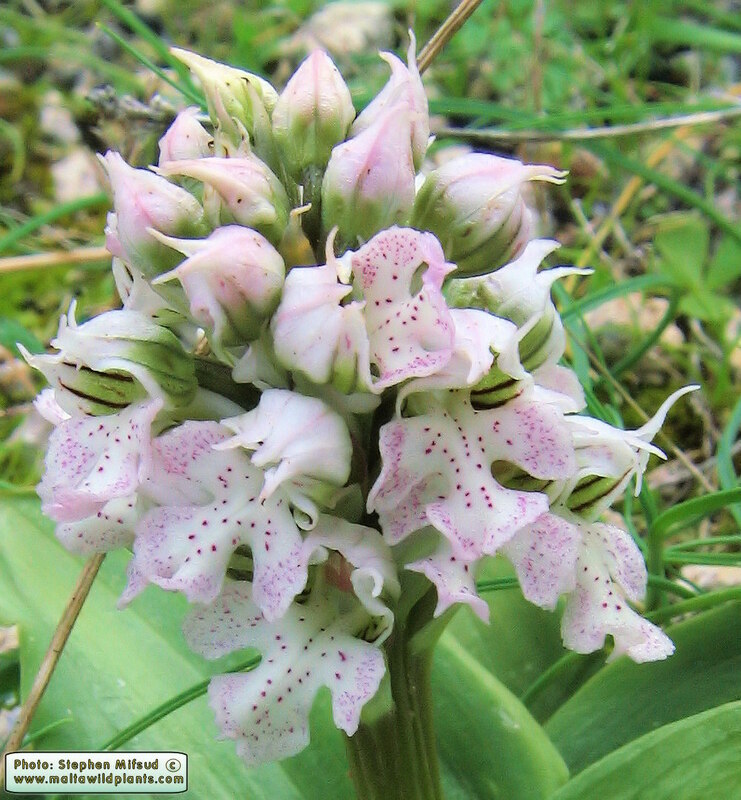 The 3 sepals are arranged as 2 upper, identical, small petals which are white and green in colour and a lower large, modified, 3-lobed, highly coloured petal which is referred to as the lip or labellum (pl. 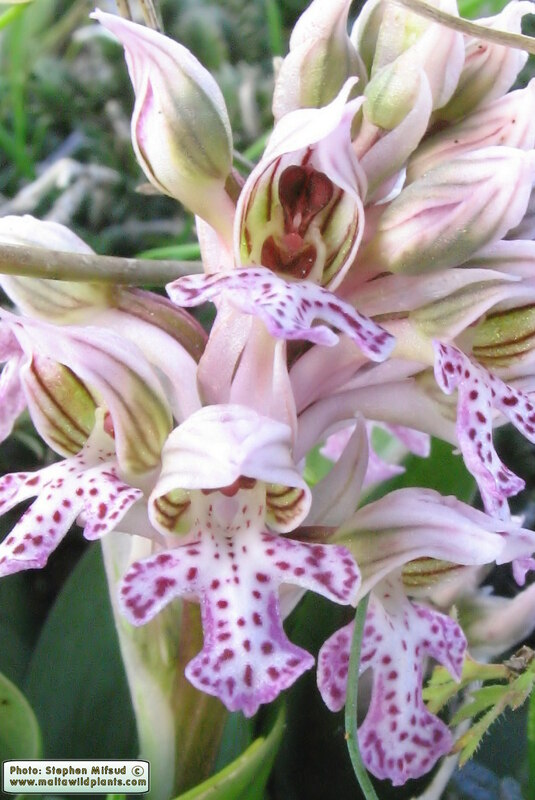 = labia). 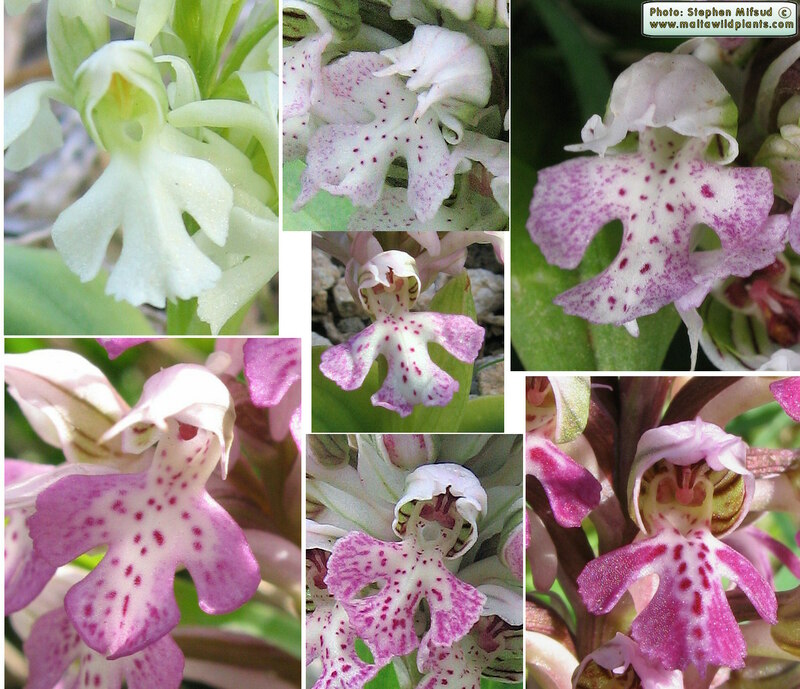 The labellum have a purple/pink border (on closer look it results to be dense number of pigmented spots) which fades away to a whitish center. 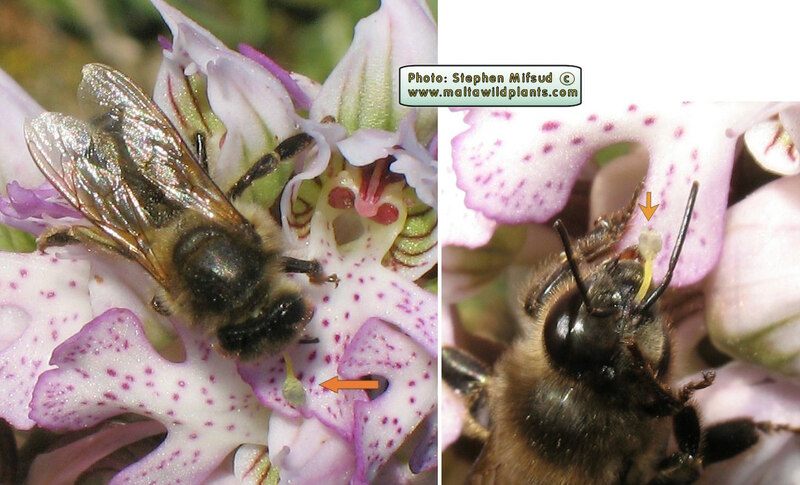 On the white center there are further some large, prominent, purple spots at random order. 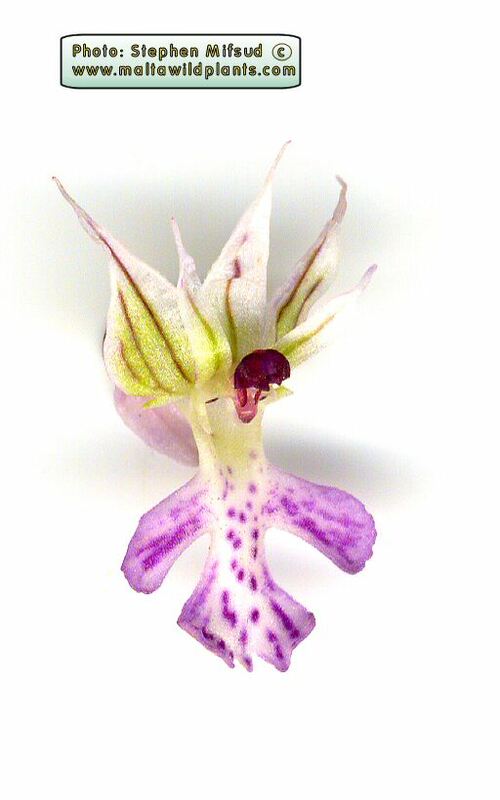 The reproductive organs are very small and united into a single column with 3 lower stigma (2 fertile and a sterile one called rostellum) and above there are the 2 large stamens (pollinia). 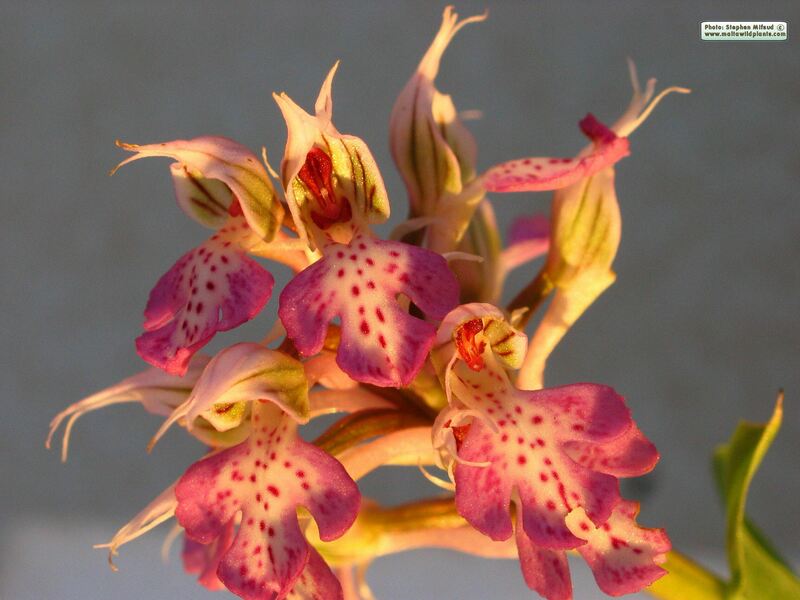 The whole structure is reddish brown in colour and deep inside the complex structure of flower, yet still visible from outside. 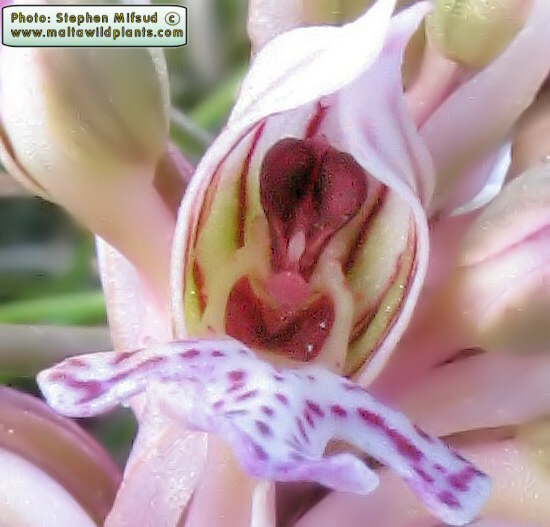 The flower also have a long, closed tube-like structure (called the spur) where nectar is secreted and makes the flower have a mild fragrance. 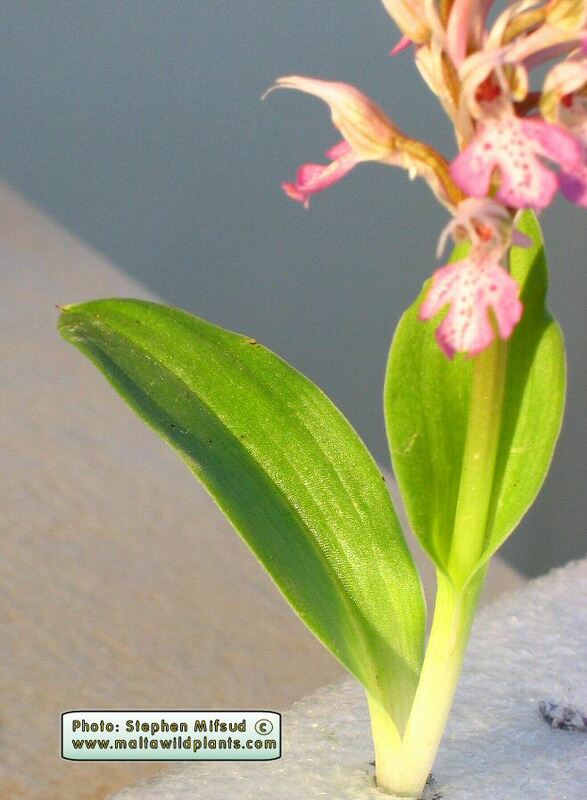 The spur is located at the base of the labellum just below the stigma. 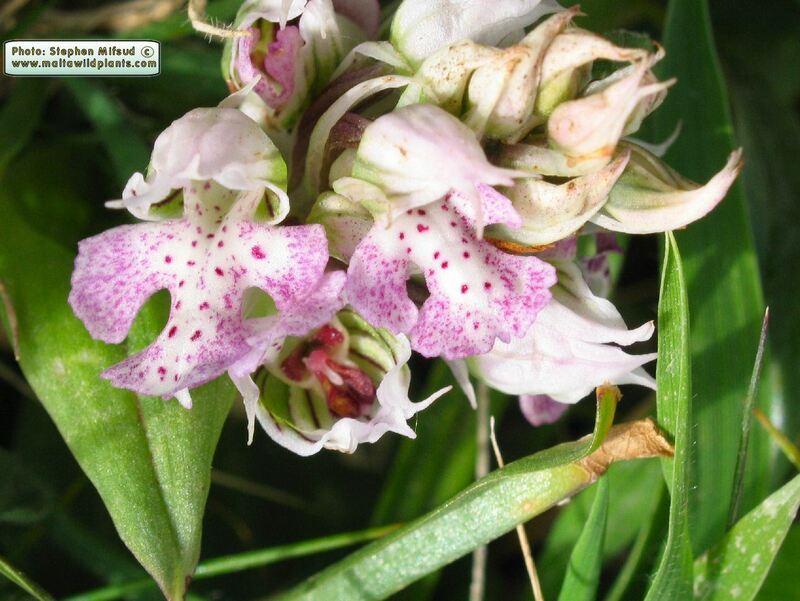 The flowers develop into the fruit, which are green oval capsules that produce numerous tiny seeds. 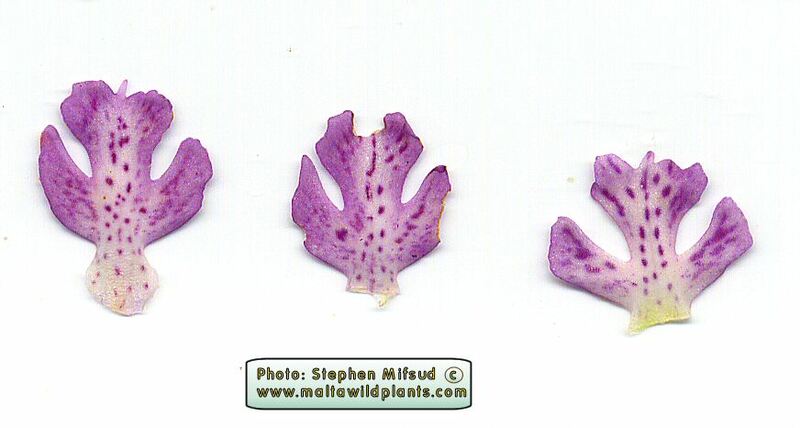 These escape when the ripe fruit splits open. 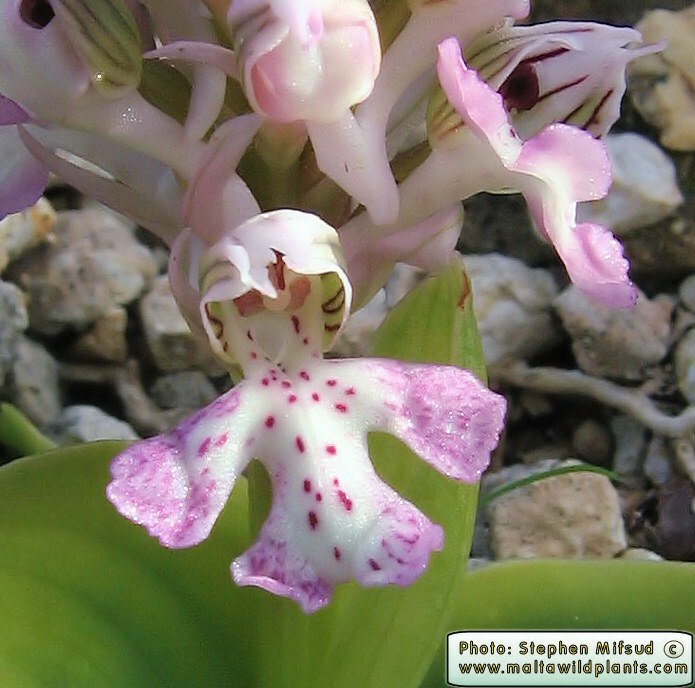 The plant develops asexually from division of tubers, or sexually from the seeds, the former being much more successful. 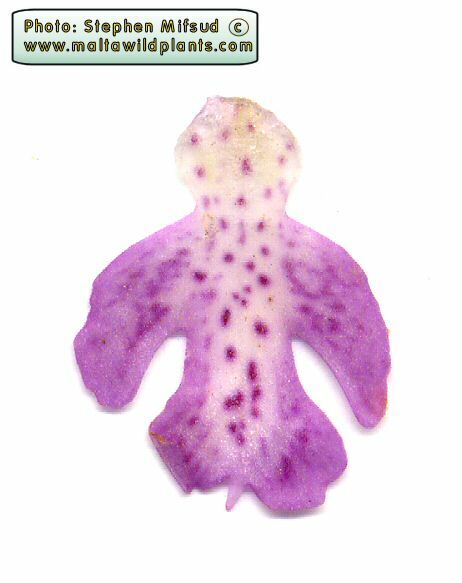 Here is an excellent example of hybridization between O. ursulata and O. conica showing both parents and offspring in one photo. 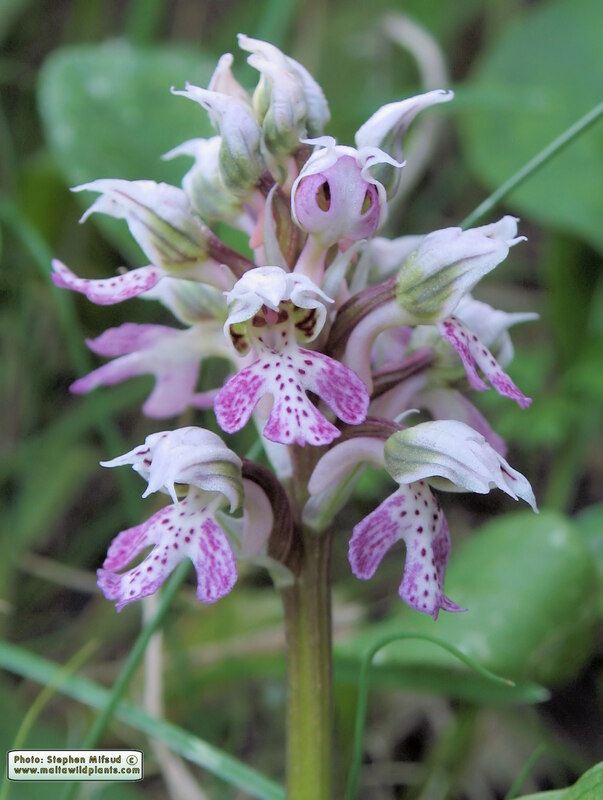 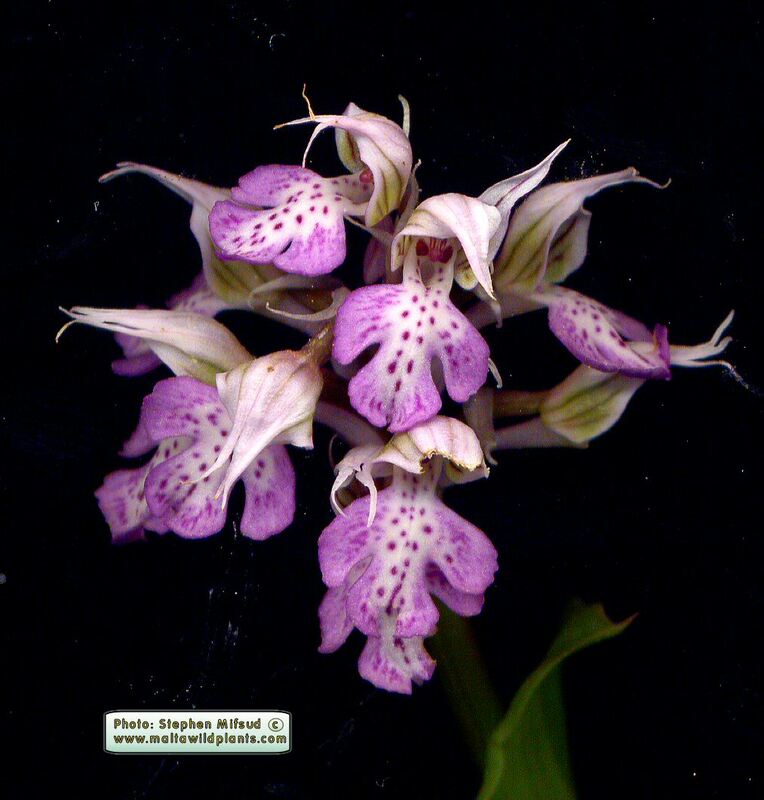 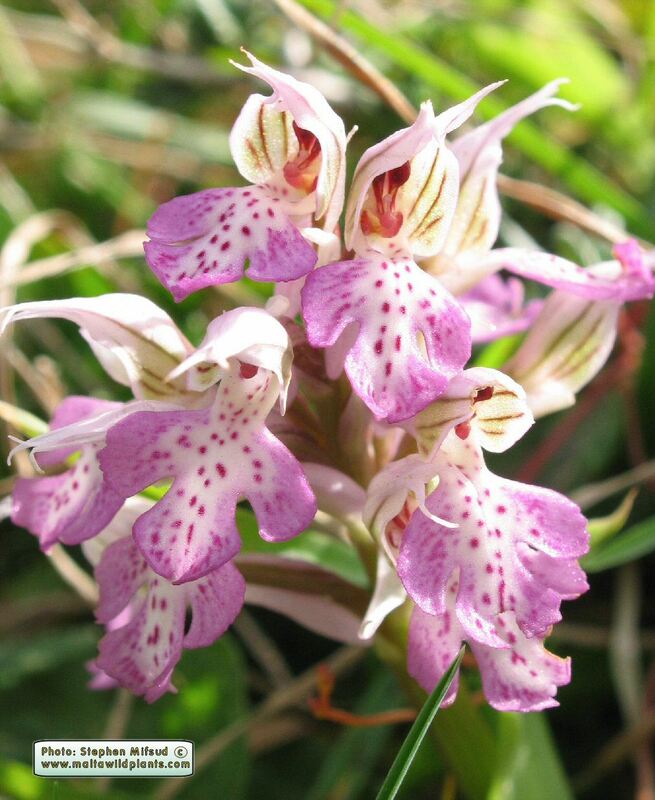 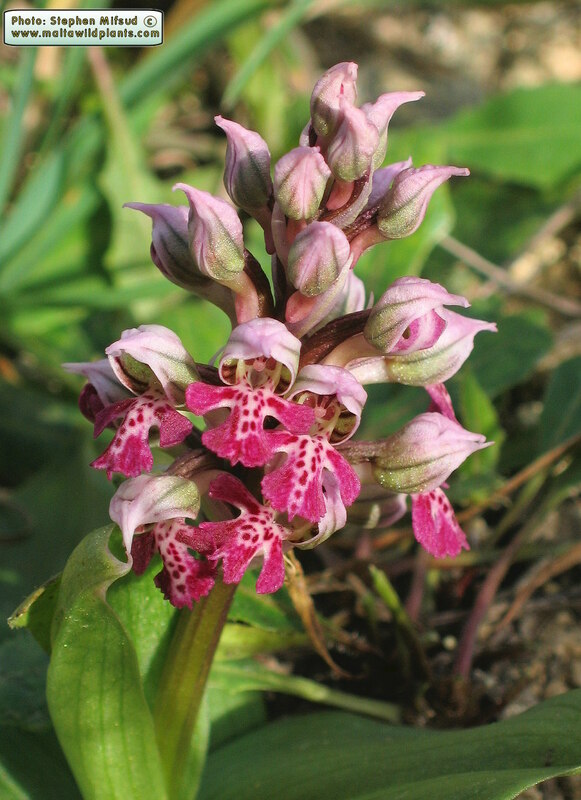 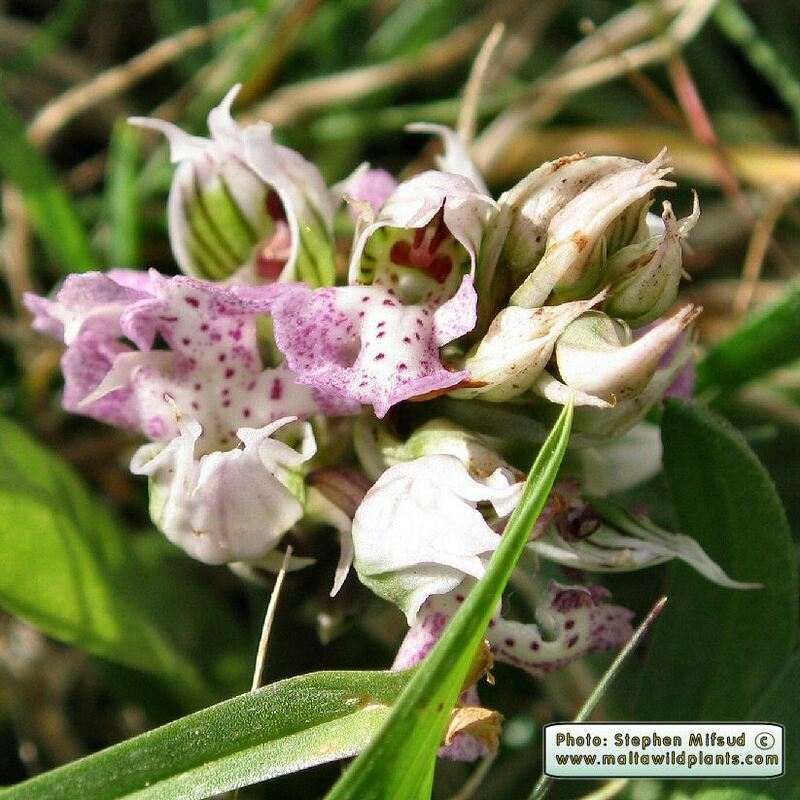 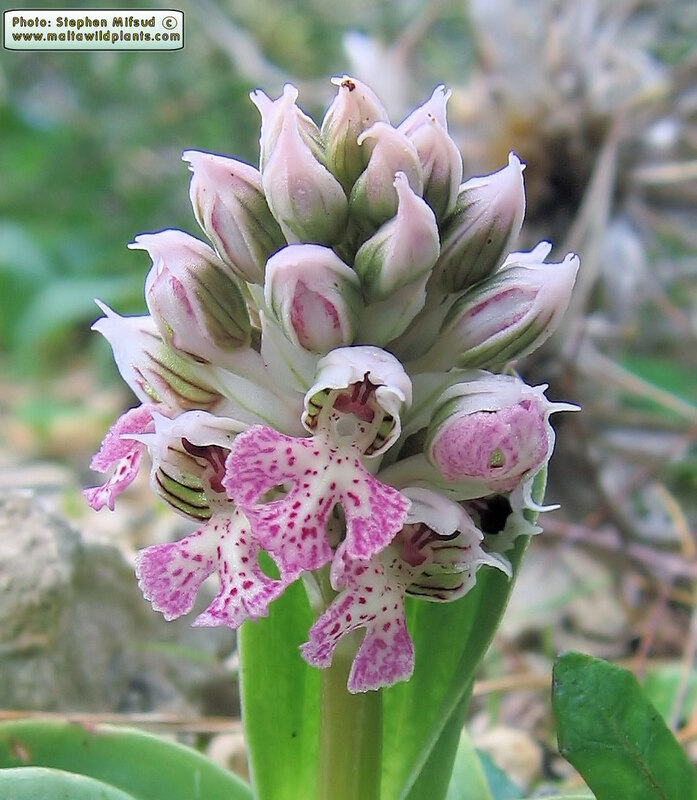 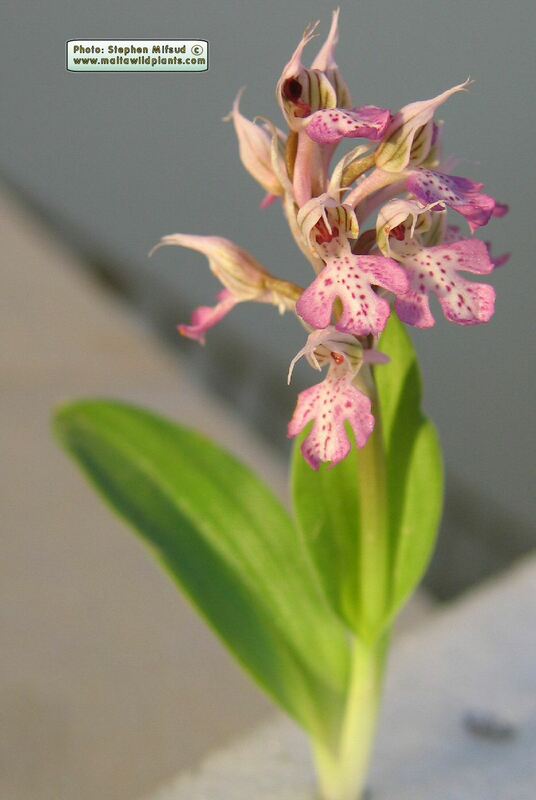 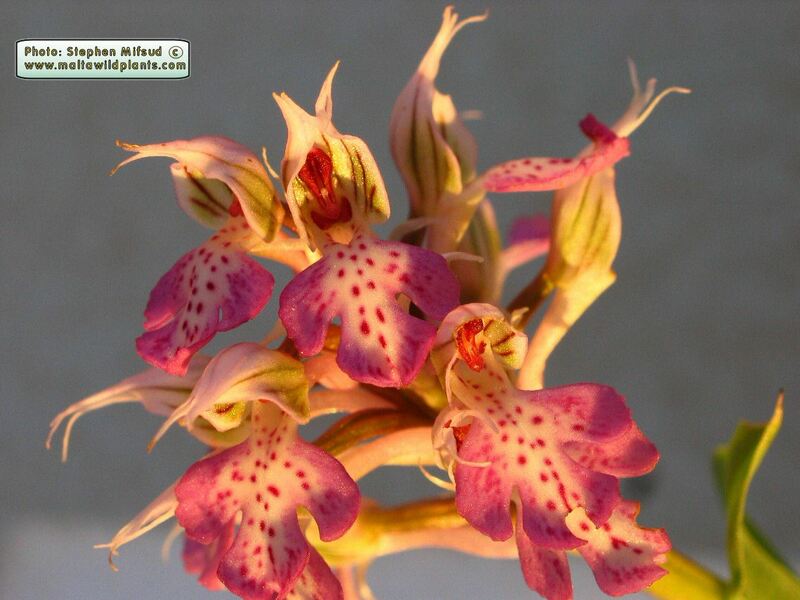 Orchis conica is one of the first flowering orchids in Malta. 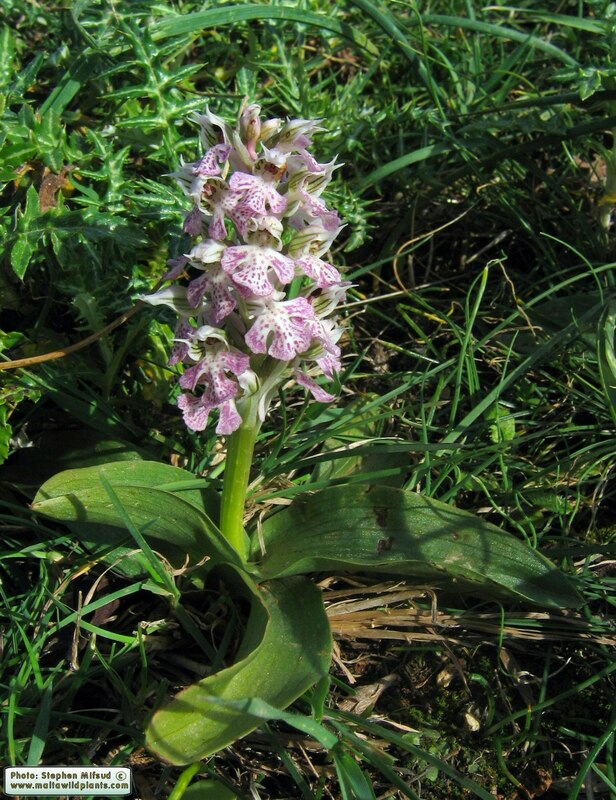 It is normally in flower by the end of January, depending on seasonal weather conditions. 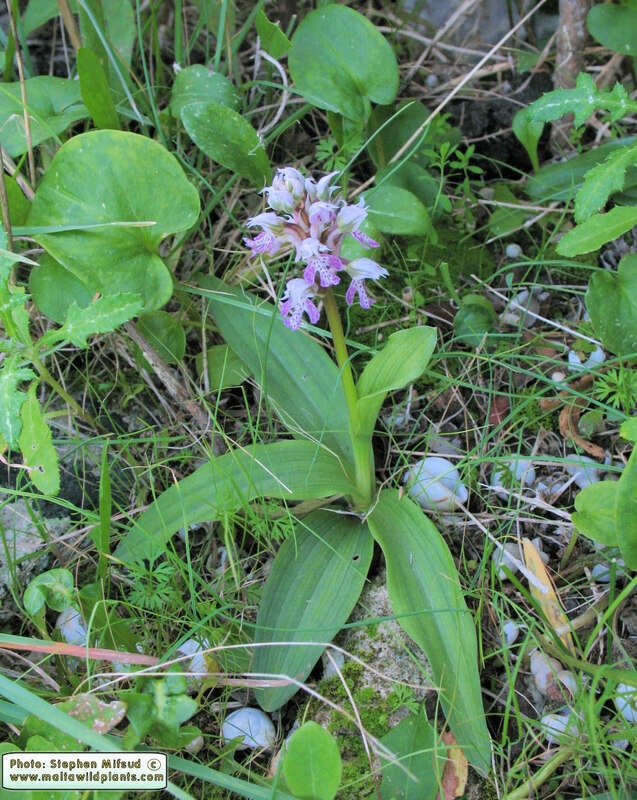 Other common early flowering Orchids are Ophrys mesaritica (which flowes in the beginning of January) and Orchis collina which flowers at the same time with O. conicaa. 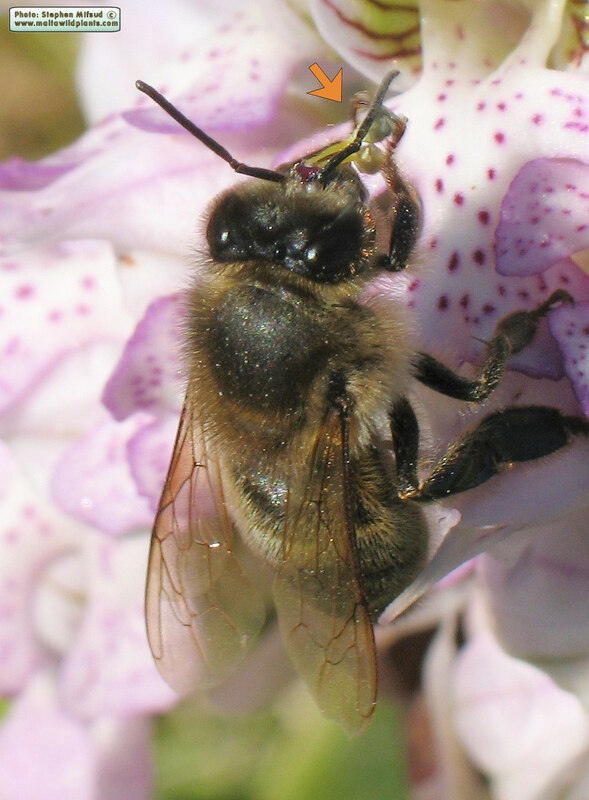 Since the nectar is in the 8mm long spur, the pollinator insect must have a tongue extending to about this length.